Super-TIGER on the Ice: A Tale of Two Poles, and back to the US. A Tale of Two Poles, and back to the US. Apologies for the delay in updating the blog, the last few weeks have gone by in a blur. I am now safely back in my office at Washington University and the balmy conditions of St. Louis (19F/-8C). Our time at the South Pole, although enjoyable and wonderfully unique was ultimately fruitless given our aim of recovering the SuperTIGER payload. However, before I discuss that, I did promise a brief explanation of my earlier cryptic point about there being two South Pole markers. 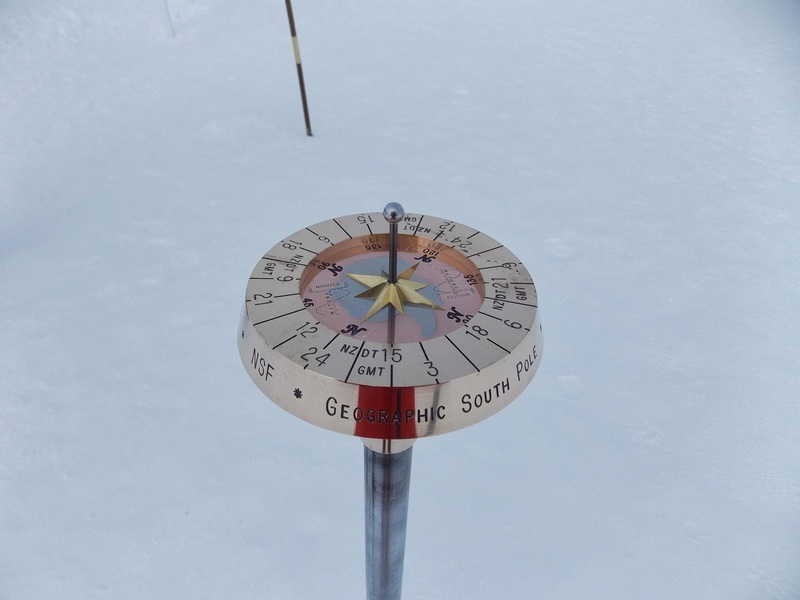 Generally the photos you see of the South Pole marker are of the nice "barber shop" pole with the shiny ball on top. This pole is actually the "ceremonial" South Pole, which is not at the exact location of the geographic South Pole. Why is that you ask? Well, the polar ice sheet actually moves (or slides if you will) at a rate of about 10 meters (32') per year, so the ceremonial South Pole (which is not relocated by anyone) is actually a few hundred feet away from 90 degrees south! It does however look snazzy. Did I run around the world several times? Yes, yes I did. Now, onto the business of the recovery that never happened. At 930am on 1/22/14, a three man team consisting of Thomas Hams, Scott Battaion and Bill McCormick flew to the SuperTIGER payload location on a Twin-Otter aircraft. The weather conditions were generally favorable and conditions at the site were clear. However, due to large "sastrugi" (http://en.wikipedia.org/wiki/Zastruga) around the payload the pilot was unable to land! The payload was indeed spotted, but all that could be done was for photographs to be taken. So we know the payload is there, just waiting once more for us to come get it. Already plans are being discussed for another recovery attempt next season, this time hopefully we will not be hampered by a government shut-down allowing us to get to the payload much earlier. An aircraft will have to land several miles away from the payload where the terrain is more favorable, and a groom team will ski-doo their way over to the instrument to begin preparing a ski-way again. Once more an intrepid group of SuperTIGER scientists will have to fly in and begin the careful work of deconstructing the payload for transport back to the United States. Until then, we analyze the haul of data from our 2012 flight and wait. Overall, while disappointed, I am extremely grateful for the opportunity to travel to such a unique and beautiful place as Antarctica. My fear of losing fingers and toes never materialized, and I managed to stand at the bottom of the world. I fully expect that next year the SuperTIGER team will have succeeded in recovering our precious experiment, eager to rebuild and re-fly to pursue our goal of unraveling the origins of Galactic Cosmic Rays (you didn't think I did this because I love the cold right? ).